Rev. Garrett has been our Pastor since April 2004. He is married to Vickie Adcock Garrett and has three daughters, Rachel, Joni, and Marcie. On March 18, 2012, Rachel, his oldest daughter was married to Adam Gardner, a truly great young man. Robert received his Bachelor of Business Administration from the University of Memphis in Tennessee and his Masters of Religious Education from the Southwestern Baptist Theological Seminary. He enjoys spending time with his wife Vickie and his lovely but many times crazy daughters and his awesome son-in-laws. He also enjoys golfing with his deacons and accountability partners. Dakota Gragg became our youth minister in August of 2018. He has been married to his wife, Hailey Gragg, since September 10, 2016. He is a graduate of Liberty University. His passion is to see students experience life change, because of Jesus, one step at a time. ​Steve & Susie Dowd have been married for 37 years. They have four children and six grandchildren. Susie, was born and raised in the Charlotte, NC area and came to Piedmont Bible College. Steve was born and raised in Atlanta, GA and studied at DeKalb College and Liberty University. 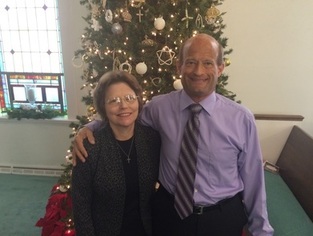 They met at Salem Baptist Church in Winston Salem in 1979 and married in April of 1980. Steve and Susie have both felt the call of God upon their lives and have purposed to serve Him throughout their marriage in a number of churches and ministries. experience. She attends Churchland Baptist Church. She has a daughter, Molly who she loves spending all her free time with.